CHAMPAIGN, Ill. — Researchers say they can now produce a vast library of unique cyclic compounds, some with the capacity to interrupt specific protein-protein interactions that play a role in disease. The new compounds have cyclic structures that give them stability and enhance their ability to bind to their targets. The study, reported in the journal Nature Chemical Biology, also revealed that one of the newly generated compounds interferes with the binding of an HIV protein to a human protein, an interaction vital to the virus's life cycle. 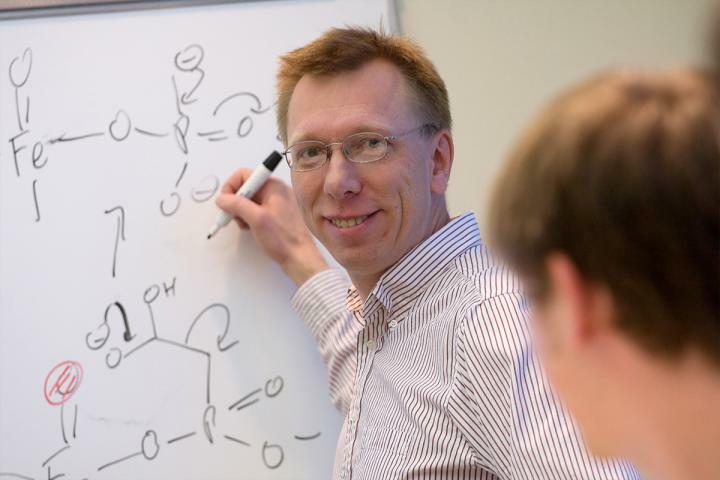 Most drug-discovery efforts focus on disease-inducing interactions in enzymes and proteins that involve classic "lock-and-key" mechanisms, said University of Illinois chemistry professor Wilfred van der Donk, a Howard Hughes Medical Institute Investigator who co-led the study with University of Southampton chemical biology professor Ali Tavassoli. "In most cases, small chemical drugs bind to cavities in enzymes, where the chemical reactions take place. By binding to these crevices, the drugs prevent the enzymes from working." However, many disease processes involve protein-protein interactions that do not fit this model, van der Donk said. "These have long been considered challenging because they do not involve such cavities. These protein-protein interactions often are made up of extended surfaces that can be difficult to inhibit with small molecules," he said. Linear peptides also are problematic. They can be "floppy, like spaghetti, and therefore most of the time are in incorrect orientations to bind," van der Donk said. Cyclic molecules composed of one or more rings of amino acids are more stable and less susceptible to cellular enzymes that tend to chew off the ends of linear peptides. They are thus more likely to successfully bind to their targets. In the new study, van der Donk and his colleagues made use of an enzyme they discovered from a bacterium that lives in the ocean. "This enzyme's natural role is to make about 30 different cyclic proteins, and we tested whether it could make analogs of these natural products in Escherichia coli," van der Donk said. E. coli has been used as a drug-producing factory for pharmaceutical products. The genetic sequences inserted into E. coli all coded for a series of amino acids recognized by the enzyme. By randomly adding specific amino acids to this "leader sequence," the team was able to generate a library of more than a million unique multicyclic proteins. Tavassoli and his colleagues next screened this library in genetically engineered E. coli for proteins that could interrupt the binding of the HIV protein to its human host cell target. "We engineered the genes of the E. coli strain such that its survival depended on disrupting the interaction between the human protein and an HIV protein," Tavassoli said. His team found three potential therapeutic agents. Further testing revealed that one of the three worked best. In a test tube and in cells, the compound bound to the human protein, stopping the HIV protein from interacting with it. "The real advance here is the ability to generate libraries of millions of potentially therapeutic agents," Tavassoli said. "These could be screened to identify inhibitors of other disease-related processes, which is where its real potential lies." The National Institutes of Health, the Howard Hughes Medical Institute and the United Kingdom Engineering and Physical Sciences Research Council supported this research. Van der Donk also is an affiliate of the Carl R. Woese Institute for Genomic Biology at the U. of I. The paper "A lanthipeptide library used to identify a protein-protein interaction inhibitor" is available online and from the U. of I. News Bureau.